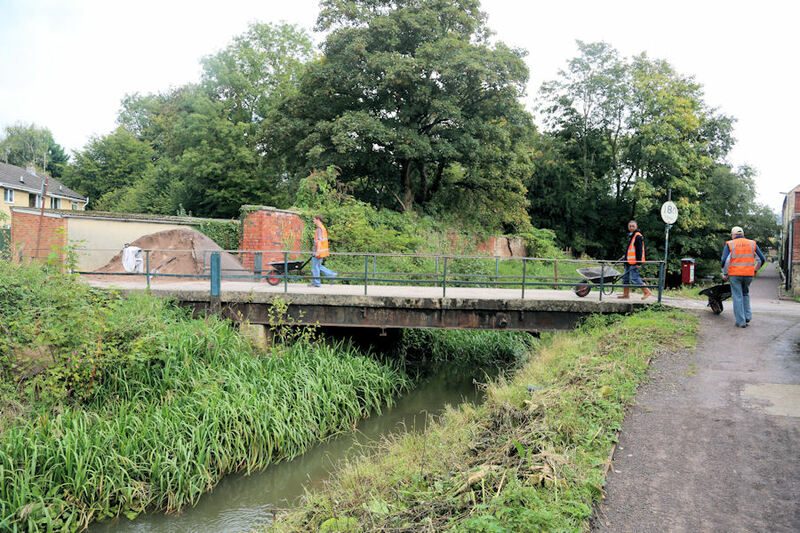 Progress has been made on the replacement of Lodgemore Bridge in Stroud. Lodgemore Bridge has served the very busy Woollen Specialist Products factory at Lodgemore Mill for many years. The original wooden swing bridge was operated by boaters hauling coal and grain along the Stroudwater. It was replaced with a metal swing bridge in the 1920s. This was fixed in the ‘on position’ i.e across the closed canal when the navigation was closed. The existing structure still bears the 8 ton limit sign. See the top photo taken by Mike Gallagher in 2012. Angela Rowbotham is an engineer who works with KGAL Consulting Engineers at what the company refers to as its ‘Gloucester office’. Angela’s office is in fact an ‘apple core’s throw’ away from the Stroudwater Navigation near Saul Junction. The office is in converted farm buildings at Walk Farm off Church Lane Saul. Equally close is Saul Marina where Angela moors her narrowboat. The problems created by a combination of a site restricted both by size and land ownership litigation seem to have been solved by Angela’s application of an expertise based upon her impressive engineering qualifications allied to some lateral thinking borne of her own boating experience. The result is a single pylon, manually operated, hydraulic bascule bridge. Raising the 6 tonne bridge deck by manual winding is assisted by a 6 tonne kentledge, or counter weight. The results of Angela’s evaluation of the problems and solutions can be seen in the artists’ impression in the second picture above. Cotswold Canals Trust member and accomplished artist Peter Westley produced this drawing from the technical engineering plans. "We have put this design forward for planning consent with some enthusiasm for its striking design. 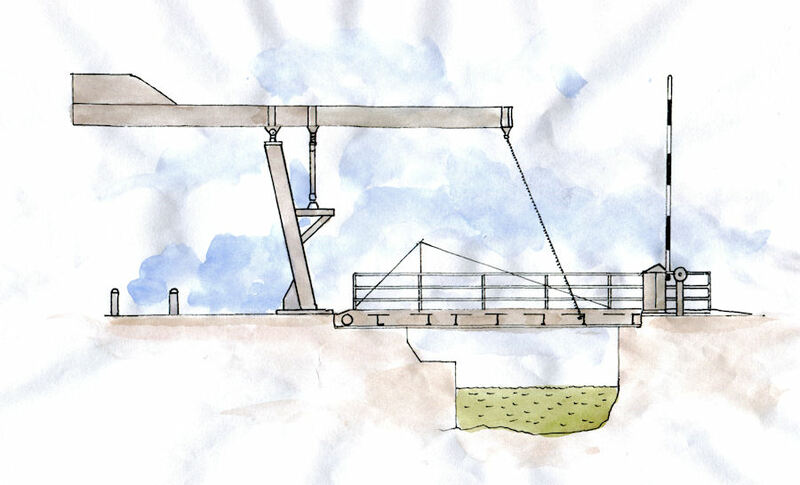 There will have to be other lift bridges created on the next phase of the restoration and this single angled pylon design creates the opportunity for an iconic structure to become associated with the Stroudwater Navigation. This is an opportunity to create the heritage of the future if you like." Click on the WSP Logo below to see why this busy company needs the bridge!